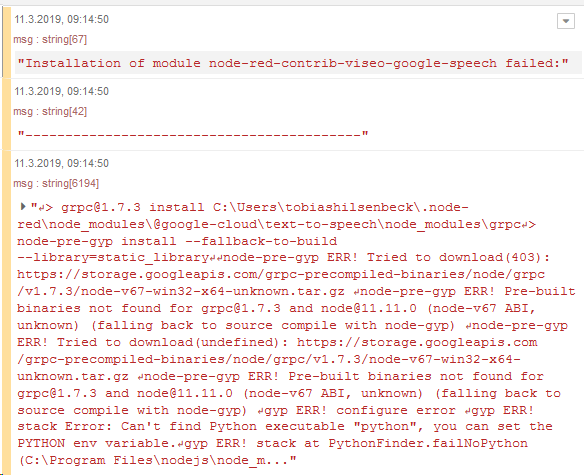 i have a prblem to install node-red-contrib-viseo-google-speech. What does it show as the last dozen lines at the end of the install? Also which versions of node and npm are you using? Looks like it can't find some dependencies, so it tries to compile them instead which fails because it can't find Python. Try installing python and then try again. You haven't shown us the complete error log yet. The easiest way to get that is to install it from the command line. MSBUILD : error MSB1009: Die Projektdatei ist nicht vorhanden. npm WARN system32 No repository field. npm WARN system32 No license field. npm ERR! Failed at the grpc@1.7.3 install script. I don't know much about windows but I don't think you should be installing in that directory. A windows guru will have to confirm that though (or perhaps the docs on using node-red with windows will help). Which directory, and is it the right one? It should be the same one that has your flows. i cann install every other node from google. for example "node-red-contrib-viseo-google-authentication". It fails for me too, on Ubuntu with nodejs 10. It might be a node 10 issue, you could try rolling back to 8.x.